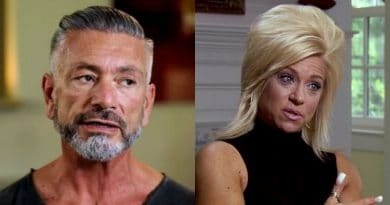 Long Island Medium fans know that Larry Caputo has moved on from Theresa after 28-years of marriage but it is now revealed how this happened. Larry was captured in pictures over the weekend shopping with a mystery woman. The pictures caused fans to become very curious and somewhat furious at the same time. Who is this woman and why is he not back in Long Island with Theresa recuperating from surgery? Today we not only know her name, but it is also revealed how Larry met his 53-year-old new love interest, according to Extra TV. Long Island Medium Estranged Husband In Alabama? Fans became upset with the Long Island Medium’s estranged husband over the weekend. He was seen shopping for what looked like toilet paper and paper towels with a platinum-blonde. Larry was in Decatur, Alabama, apparently making sure this woman was stocked with paper goods. But Theresa was home in Long Island at resting after recent knee surgery. The two report they are both still very much the best of friends, so fans asked why wasn’t Larry helping his estranged wife? Theresa was in Hawaii for her birthday when an ocean wave hit her and “she tore her ACL after getting hit by a wave in the ocean, reports Life and Style Magazine. Back home in Long Island, she underwent surgery to repair her knee and she’s looking at eight weeks of physical rehab. Maybe Not Such a Cordial Divorce? It didn’t take long for this mystery woman’s name to emerge. When you hear how they met and what went on, it might explain why Theresa and Larry might not be as cordial as first reported. Despite reports of a cordial divorce and the two remaining good friends, Larry is shopping in Alabama at Bargain Hunt with a blonde. The only things fans knew at first was that whoever she was, she was well stocked with paper goods. That was evident from her shopping cart which Larry dutifully pushed for her. Who is the Mystery Woman With Long Island Medium’s Larry? So who is she? Her name is Connie Stauddy and fans of the show have put two and two together. 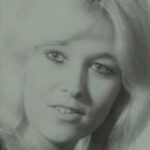 They believe this is who Larry was referring to when he told reporters he has met “someone special.” Larry met Connie online when she reached out to Theresa to book a reading. TMZ describes Larry’s new girlfriend as a 53-year-old “hot grandma.” They report that Connie has “a couple of cute grandkids” that she’s very proud of. She too is going through a divorce so she is in the same boat as Larry. Larry and Connie continued a relationship online for months. This long distance relationship started because Connie wanted a reading from Theresa. That might add a bit of an insult to injury for the Long Island Medium. It is obvious that Larry and Connie have now met face to face from the pictures that emerged over the weekend. Pushing a shopping cart behind a woman doesn’t scream first romantic date. It looks more like a domesticated situation. Once these type of shopping trips pop up in a relationship, you’ve gotten to know each other fairly well. Some fans of the Long Island Medium didn’t welcome Larry’s shopping trip with Connie. This is especially the case with Theresa at home after surgery. With that said, Larry did have some fans of her show come to his defense. They reminded the masses that Theresa did file for divorce. Come back to Soap Dirt for more reality show and Long Island Medium news.